The Turkish embassy blamed protesters Thursday for Turkish security officials' attack in Washington, D.C., despite video evidence that contradicts their claims. 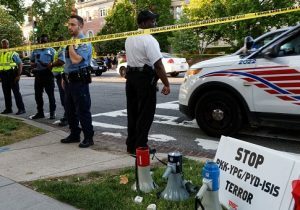 "Groups affiliated with the PKK, which the U.S. and Turkey have designated as a terrorist organization, gathered yesterday without permit in Sheridan Circle in the immediate vicinity of the Ambassador’s Residence, while the President of Turkey was visiting the Residence," the embassy said in a statement. "The demonstrators began aggressively provoking Turkish-American citizens who had peacefully assembled to greet the President. The Turkish-Americans responded in self-defense and one of them was seriously injured. The violence and injuries were the result of this unpermitted, provocative demonstration." Multiple videos taken at the scene by Voice of America show that supporters of Turkish president Recep Tayyip Erdogan initiated the violence with one supporter shoving a female protester to the ground. After police had managed to separate the two sides, Erdogan's bodyguards came to the scene. Video shows Erdogan supporters and bodyguards flooding through the police line and beating protesters on American soil. The Turkish embassy did not respond to questions about why video evidence contradicts their statement or whether they believe violent attacks are an appropriate response to protests. Nor did they answer whether or not the Turkish personnel involved in the attack would be disciplined. D.C. police chief Peter Newsham strongly condemned the attack on protesters and vowed to do everything within the department's power to hold the attackers accountable but admitted "there could be a diplomatic immunity issue." State Department spokesperson Heather Nauert said the agency is "concerned by the violent incidents" and "violence is never an appropriate response to free speech." In addition, "the U.S. Department of State is working closely with local authorities concerning this incident. The case is currently under investigation and we are not going to go into specifics or speculate on what may happen." The Turkish embassy also called for efforts to be made that "provocative" protests no longer be held so as to avoid any potential future altercations. "We hope that, in the future, appropriate measures will be taken to ensure that similar provocative actions causing harm and violence do not occur," the embassy statement said.